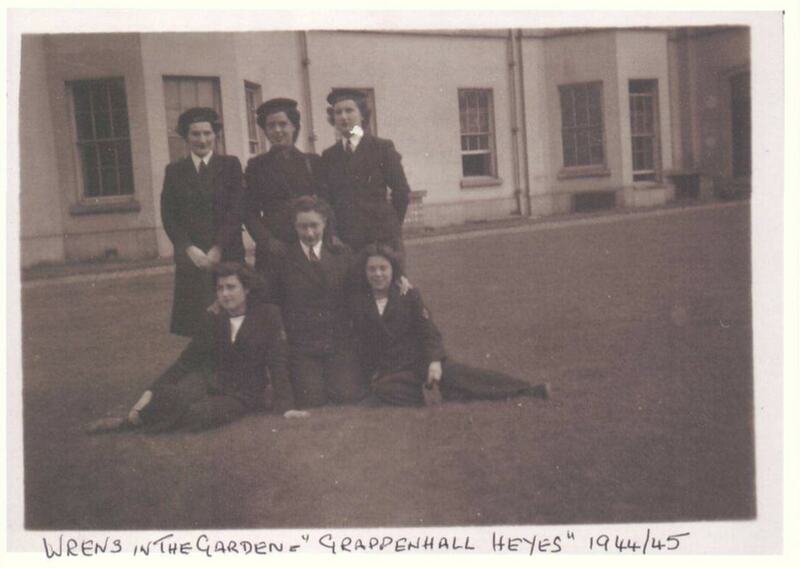 The Historical Research Co-ordinators of the Friends of Grappenhall Heys Walled Garden have collected information relating to the house and garden from Ruth Brown, a local resident, Malcolm Hitt, the son of one of the Head Gardeners who worked at the garden in the 1940’s, and Doris Mellen who was in the WRNS. We are very grateful to them for sharing some of their early memories of the garden. 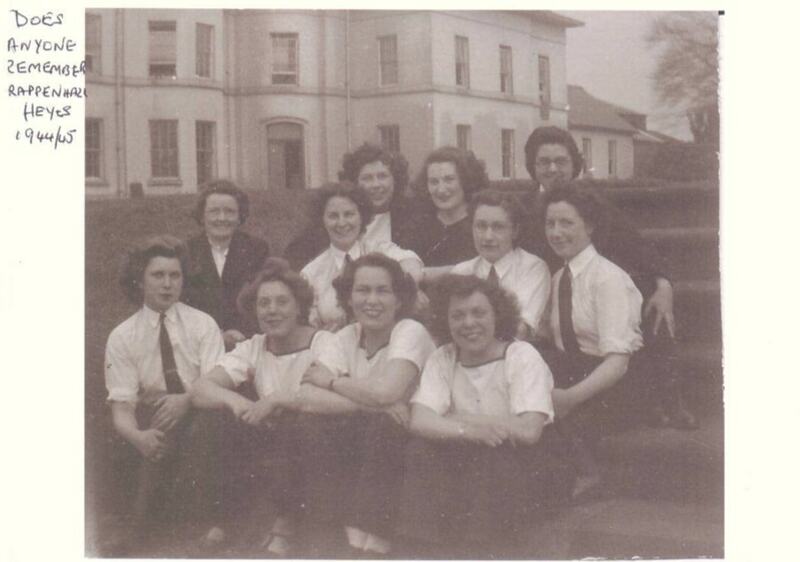 There are also two photographs of the WRNS who were stationed at the house during the 1940’s. Doris Mellen is pictured in the second photo, kneeling down in the centre with two girls on either side of her. Click on the following links to view the information: Ruth Brown, Malcolm Hitt, Doris Mellen. If you have any memories of the garden that you would like to share, or early photos, we would be very pleased to hear from you. Questionnaires are available from the tearooms at the garden or you can click here to download one. If you would like to telephone the Parish Council Office on 01925 264918 we will be able to put you in touch with the Historical Research Co-ordinators. 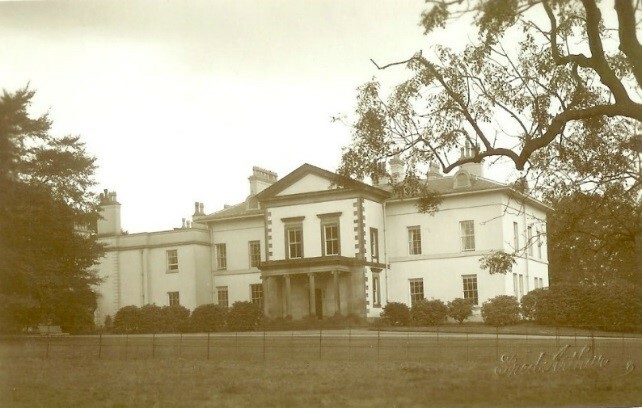 The Estate was founded by Thomas Parr around 1830. Thomas was born in 1792 into an old-established Lancashire family with banking interests in Warrington. After a tragically short marriage in 1825 which produced just one daughter he married again, in 1833, Alice Charlton from Shropshire and they eventually had eight more children. The land which made up the Estate had been farmed in smaller units for many years before the Estate’s formation. Thomas bought the land, including Witherwin Farm and what became Dairy Farm, over a period of some years, until he eventually owned an area of around 150 acres. The house was built in a raised location in the centre of the land with impressive views over the parkland and Appleton Park. Formal gardens surrounded the house on three sides and made an attractive setting with lawns, terraces and a bowling green around the house, surrounded by parkland and, further away, farmland. Thomas’s third son, J. Charlton Parr, inherited the Estate in 1870 and lived in it until 1918. Joseph was a very wealthy man and, although he did not make great alterations to the Estate, he appears to have maintained it to a very high standard. The late 19th century seems to have been the Estate’s heyday, with photographs and accounts from the time showing a comfortable and well-staffed home for Joseph, his wife and their four children. On Joseph’s death in 1922 the Estate passed to his son, Roger Charlton Parr and later to Major H.C. Parr. The house was not lived in by the family after 1941 and it seems likely that the Estate suffered the same economic pressures as so many country seats during and after the Second World War. The house and formal gardens were sold in 1951, for £7,500, to the British Transport Commission. The farms and other structures were also sold around this time to a variety of buyers. Finally, after a period as a furniture store, the House and surrounding land passed to the Warrington-Runcorn Development Corporation in 1975. They demolished the house, which was by then in a very dilapidated condition, as well as many of the associated structures. The history of the Walled Garden probably began well before 1830, when small-scale marl extraction created the Garden’s distinctive ponds. Marl pits are shown on the 1829 Grappenhall Tithe Map in approximately the same places as the ponds are now found in the Walled Garden. Unusually, the Walled Garden consists of both a formal, rectangular Kitchen Garden and informal Pleasure Grounds containing three ponds, all within a single boundary wall. The Kitchen Garden was almost certainly built when the Estate was formed in the early 1830s, as was normal at the time, to provide fruit, vegetables and flowers for the owner’s table. A range of greenhouses built along the sunniest side of the Garden, and extended in the late 19th century, provided more exotic produce such as peaches. Separated from the Kitchen Garden by a yew hedge, the Pleasure Grounds are much more unusual. Within the same boundary wall, but accessible through a separate entrance from the house – so the owners did not have to see food-growing in the Kitchen Garden! – these provided a pleasant walk through ornamental grounds and around the ponds. As the life of the Estate declined in the 20th century, the need for the Walled Garden reduced. Fortunately it was allowed to ‘hibernate’ rather than being destroyed, as many were, so key historical elements such as paths, greenhouses and some plants were not lost. In the 1950s, when the other estate buildings and the farms were sold to various purchasers, the Walled Garden was gifted to Mr. Power, a former employee, who is known to have used it to raise poultry. 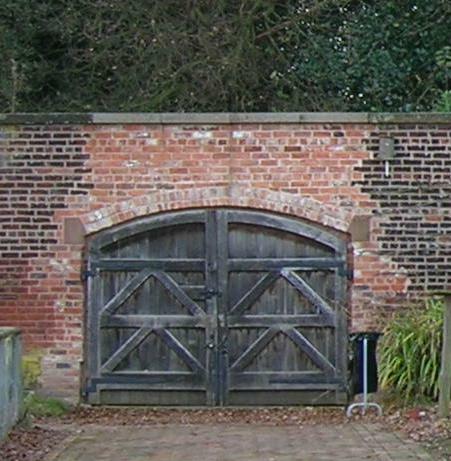 By the time the land came into the ownership of Warrington-Runcorn Development Corporation in 1975 the Walled Garden was in a poor state – photographs show abandoned cars and other dumping – but the basic structure and some historical elements were still in place and waiting to be brought back to life. 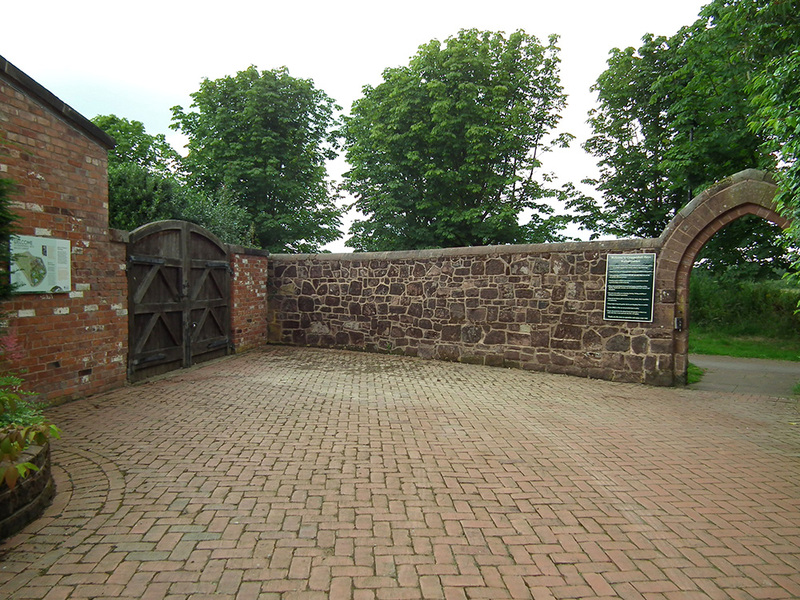 Read more about the history of the Walled Garden. When the House, grounds and Walled Garden came into the ownership of Warrington-Runcorn Development Corporation they were a sad sight. The House, dilapidated and dangerous, was soon demolished and the site cleared. The site of the House and formal gardens, by then covered in self-set trees, was handed over to the Woodland Trust, along with other wooded areas of the former Estate. The site of the house was cleared and can still be seen, marked by stone blocks from the parapet which remained on the site, within the Grappenhall Heys public open space. The Walled Garden site was originally included in the area designated for housing development, and it was intended that the Walled Garden would be built on once development began. However, a group of concerned local people formed the Grappenhall Heys Walled Garden Conservation Group to campaign for the Walled Garden site to be spared and retained as a community resource. After a determined campaign they prevailed, and the Development Corporation – later the Commission for the New Towns – undertook essential works to clear and stabilise the site. The boundary walls were rebuilt, new gates installed and the basic safety works carried out on the greenhouses. The brick buildings behind the greenhouses were largely rebuilt. Abandoned cars and other debris were removed and the area was made more secure. The Warrington Organic Gardening and Wildlife Society (WOWGS) began to cultivate the original Kitchen Garden, growing vegetables and fruit on a gradually increasing scale, and over time reclaimed most of the growing area. Many of the paths have been reinstated and, recently, a centrepiece feature for the Kitchen Garden has been planted. The silted-up ponds in the Pleasure Grounds were dug out – so deep that the diggers disappeared below ground level! – and the water flow reinstated. Scrub clearance and tree surgery restored the framework of the planting in the Pleasure Grounds, and some of the old paths were cleared and can be walked again. The overgrown yew hedge separating the Kitchen Garden from the Pleasure Grounds was severely cut back and (after a nerve-racking wait before it re-grew) is now carefully maintained to form a tidy and solid boundary between the two sections of the Garden, as it did in the Parr’s time. Of course, new patterns of use require changes to the layout which the Parrs would not recognise. An example is the new brick path and associated structures, designed to enable the Pleasure Grounds to accommodate people passing through the garden between the new housing and Witherwin Avenue. 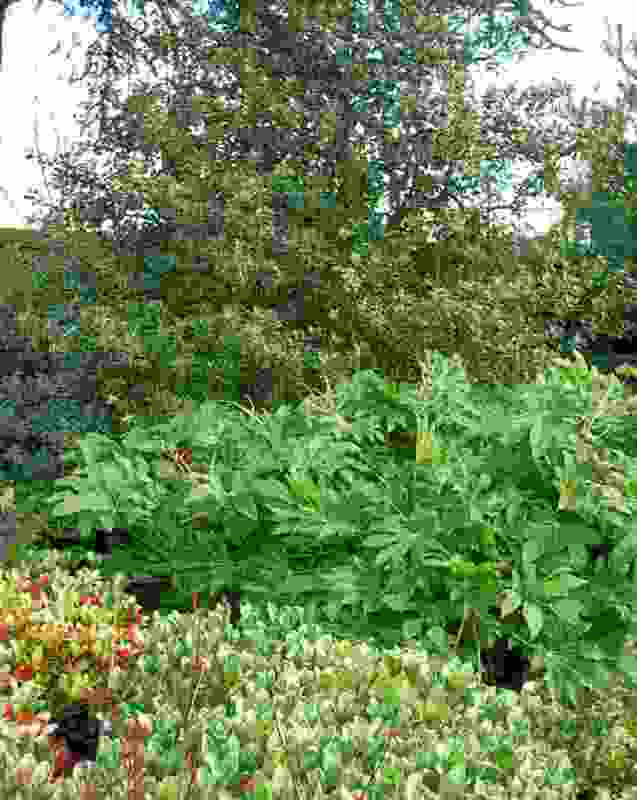 A phased programme of planting in both Kitchen Garden and Pleasure Grounds is gradually restoring the lush vegetation and productive varieties – such as old species of fruit trees – which would have characterised the Walled Garden in its heyday. 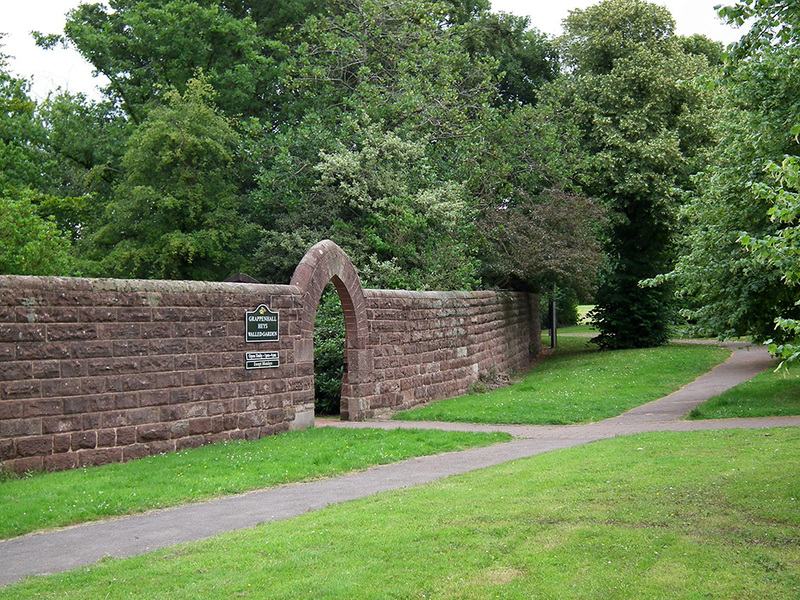 In 2005 the latest phase of renewal began with the Garden’s transfer to Grappenhall and Thelwall Parish Council. Originally supported by a long-standing Landscape Consultant and a Maintenance Contractor, the garden is now maintained by a full time Gardener /Manager and a team of hard working volunteers. The Parish Council will continue to develop the Walled Garden as a tranquil, atmospheric and historic resource for the community. Of course, a lot remains to be done. The greenhouses are still in a poor state, the brick buildings behind need to be brought back into use, and there is much work to do on the historical interpretation of the site. Find out more about how the Walled Garden may develop in the coming years at our Future Plans page. There are many aspects of the Estate’s history which we would like to know more about. Can you, or someone you know, help us fill in the gaps in our knowledge or correct any errors? If so, please contact us and we will be delighted to learn more about the history of this fascinating place. Please e-mail us or contact us.